Jordan: Any Israeli decision on call to prayer "false"
Jordanian Ministry of Awqaf and Islamic Affairs said Tuesday that any Israeli decision against Jerusalem's holy shrines, including Adhan ban bill, is false and insignificant. According to international resolutions, things must remain the same without any change, a fact that underlines that any Israeli decision on Jerusalem is false and insignificant for the city is under occupation, he continued. 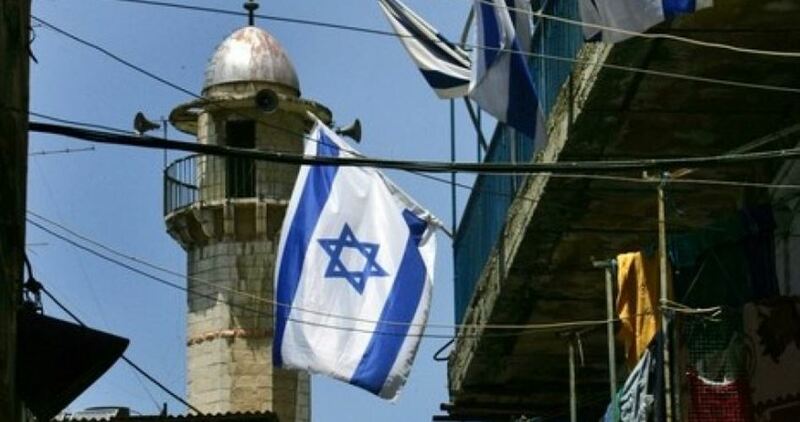 The Israeli Ministerial Committee on Legislation approved on Sunday draft legislation which could ban the use of loudspeakers to broadcast the Muslim call to prayer in Israel. The bill would need to go through three readings in the before making it into law. 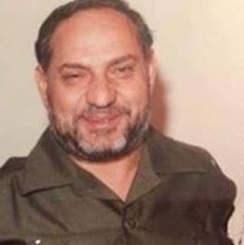 Jordanian national Shaheen Mer’I announced his decision to go on an open-ended hunger strike in solidarity with his brother, Muneer, tortured in an Israeli jail. Shaheen insisted on keeping up his hunger strike until the promises made by the Jordanian Foreign Ministry to take action as regards his brother’s case see the day. Recently, the Israeli occupation forces stormed Mer’I’s prison cell and subjected him to heavy beating, causing him to fall in a faint. 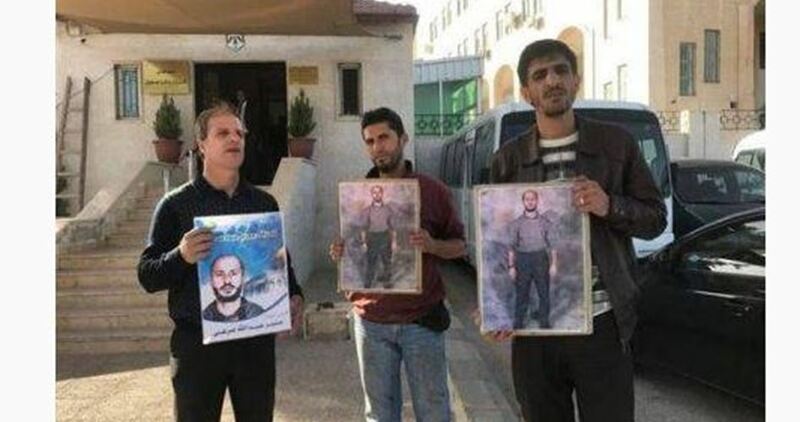 Following the move, the National Committee for Detained and Missing Jordanians in Israeli Jails issued a statement condemning the torture perpetrated by the Israeli prison authorities against Mer’I, among other detainees, in Gilboa jail. The committee called on the Jordanian Government and Foreign Ministry to keep tabs on the case and take the necessary measures to cease such brutal practices perpetrated behind Israeli prison bars. It further called for exerting pressure on the Israeli occupation authorities so as to allow prison family visits. Jordanian national Muneer Mer’I was sentenced to five back-to-back life sentences in Israeli jails. 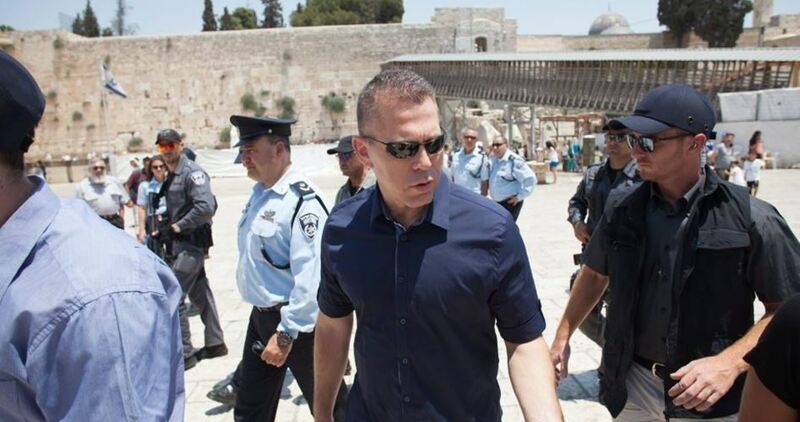 Israeli ministers and MKs announced on Monday their intents to alter the status quo at the holy al-Aqsa Mosque, challenging a 1993 deal with Jordan granting the latter sovereignty over the mosque, among other Islamic holy sites in Occupied Jerusalem. Speaking at a Knesset-hosted conference organised by “Temple Mount” activists advocating fundamental changes in the status quo at the Al-Aqsa Mosque compound, Israeli ministers and MKs launched calls for splitting up the site between Muslims and Israelis. Three cabinet ministers were among those at the gathering, which saw the launch of a new Knesset “Temple Mount Lobby”. Deputy Foreign Minister Tzipi Hotovely also “urge[d] everyone” to enter the Al-Aqsa Mosque compound if they have not yet done so. Yesterday marked the first time that this annual conference had been held at the Knesset, and was organised by fanatic “Temple Mount” campaigner and Likud MK Yehuda Glick. 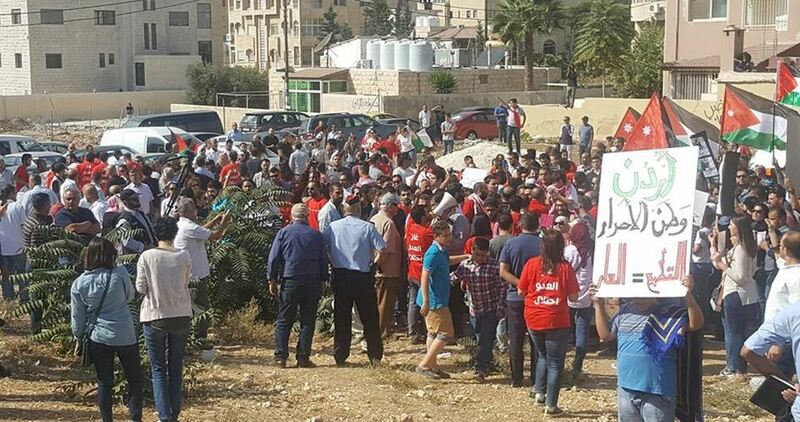 Jordanian activists have organised a protest march in Amman after the Friday prayer to demand the cancellation of the recent gas deal between Jordan’s National Electric Power Company (NEPCO) and Israel. 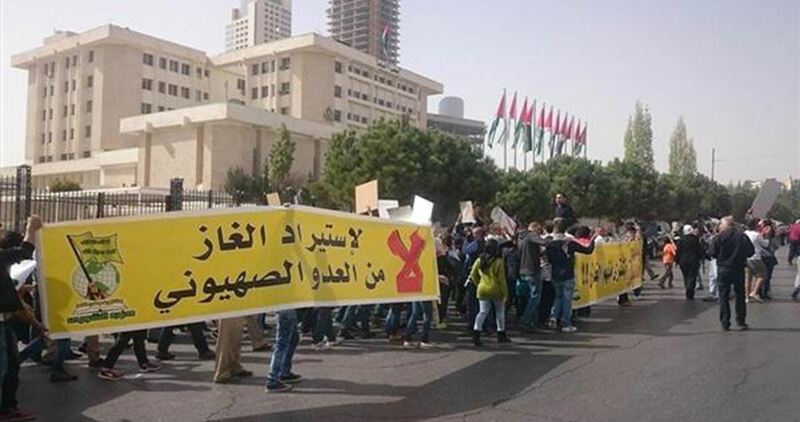 The march was organized by the National Committee against Gas Deal with Israel outside the Jordanian parliament headquarters. The protesters chanted slogans against the gas deal, considering it a support to Israel’s war crimes against the Palestinian people. The committee’s lawyer Sana al-Ashqar called on Jordanian MPs to respond to their demand to cancel the agreement as it violates the Jordanian laws and constitution. Al-Ashqar declared intention to step up the protests till the gas deal with Israel is revoked. In August, Jordan announced commitment to a gas deal worth $10 billion signed by the state-owned NEPCO with Israeli suppliers. After news of the deal became public, protests and demonstrations across Jordan gained momentum. The Jordanian security forces suppressed Wednesday afternoon a sit-in organized outside the British Embassy in Jordanian capital Amman in protest against Balfour Declaration. 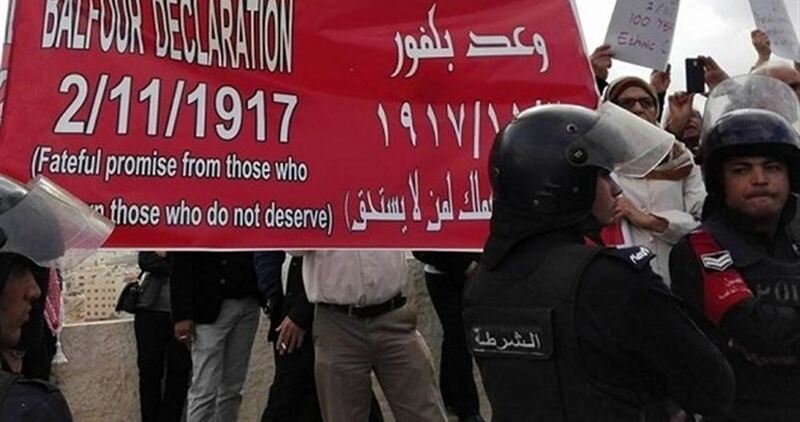 The protesters held banners reading: “The Balfour Declaration 1917 is an ill-famed promise from those who do not own to those who do not deserve”. A movement called the Balfour Declaration Centenary Campaign had earlier urged for action outside the British Embassy in Amman marking the 99th anniversary of the declaration. The 2nd of November marks the centenary of the Balfour Declaration of 1917, which began the still-ongoing occupation of Palestine and sowed the seeds of an endless nightmare for the Palestinian people, both those who were forced to flee at gunpoint and those who have managed to remain in the shredded remains of their homeland under Israel’s brutal military occupation. Hundreds of Jordanians staged a sit-in after Friday prayer outside the National Electric Power Company of Jordan (NEPCO) in protest against the controversial Jordan-Israel natural gas deal. The protesters chanted slogans and held banners calling for overturning the gas agreement. A US-led consortium leading the development of Israel's offshore gas reserves announced the deal to sell natural gas from its Leviathan field to Jordan. US firm Noble Energy, the lead partner, said the contract with the NEPCO was for 45 billion cubic meters over a 15-year term. The "National Campaign to Overturn the Gas Deal with the Zionist Entity", a broad coalition of civil society groups, activists, lawyers and political groups, is stepping up efforts to protest the agreement despite its finalization. The Jordanian security services released on Wednesday the Fatah leader Ghazi al-Husseini after 36 days of his arrest without legal basis. Family sources affirmed that he was released due to his difficult health situation as he suffers cancer and other chronic diseases that made him unable to move easily. Jordanian security forces stormed al-Husseini’s house in early September and arrested him without any known reasons. A retired major general, Ghazi al-Husseini is a member of the Palestinian National Council (PNC), which is the legislative body of the Palestine Liberation Organization (PLO). He is an opponent of the Palestinian Authority (PA) President, Mahmoud Abbas. He is also banned, by the Israeli occupation authorities, from entering the Palestinian territories. The Jordanian trade unions have called on their government to revoke the $10 billion gas agreement it recently signed with its Israeli counterpart. This came during a sit-in staged on Tuesday outside the building of trade unions in the Jordanian capital Amman. The participants in the sit-in carried placards denouncing the gas deal with Israel. 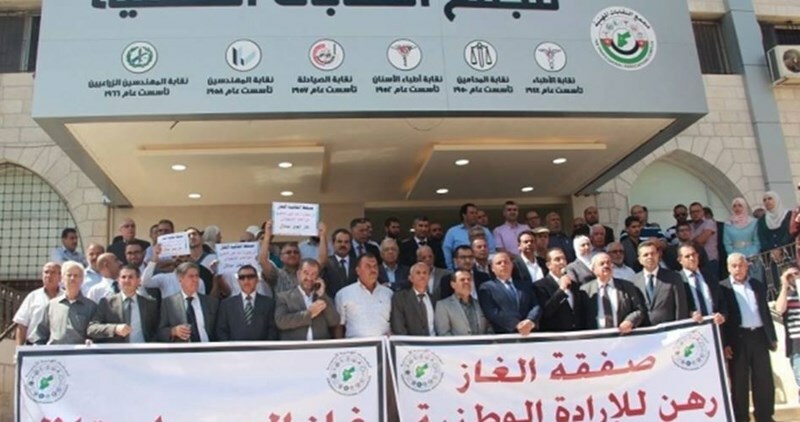 Head of the council of unions Ibrahim Attarawneh condemned the deal as “illegal and unconstitutional,” affirming that the unions would use all forms of protest to urge the government not to purchase gas from Israel.